When the Strength Tarot Card appears it represents not only physical strength but also the profound ability to cope with extreme pressures. You can be assured that you will win whatever battle you are facing. 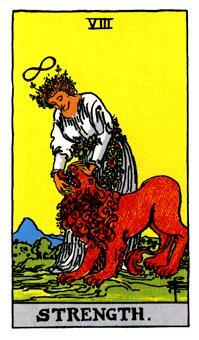 The Strength Tarot Card signifies triumph over most things. Challenges in your relationships, professional life and even mental challenges will be overcome. Defending yourself against oppression, jealousy and ignorance is made much easier. Negatively this card represents fear, insecurity and giving up. It can sometimes signify being beaten by unfairly. The Strength Tarot Card often warns of missed opportunities and is a reminder not to give up when you could be so close to achieving what you seek.